Taste and Style Just Aren't Enough was commissioned by the California Institute of the Arts as an advertisement that would appeal to a unique type of prospective student. The school was looking to brand itself and be more accessible than those institutions that taught taste and style. De Bretteville, a well-known graphic designer, conceptualized the poster around three main themes: ecology, human behavior, and technology. The pinecone's regenerative ability represents ecology, the jack represents human behavior and the logic of game playing, and the drawn circuit board refers to technology. De Bretteville and Betye Saar worked together in Southern California feminist networks. 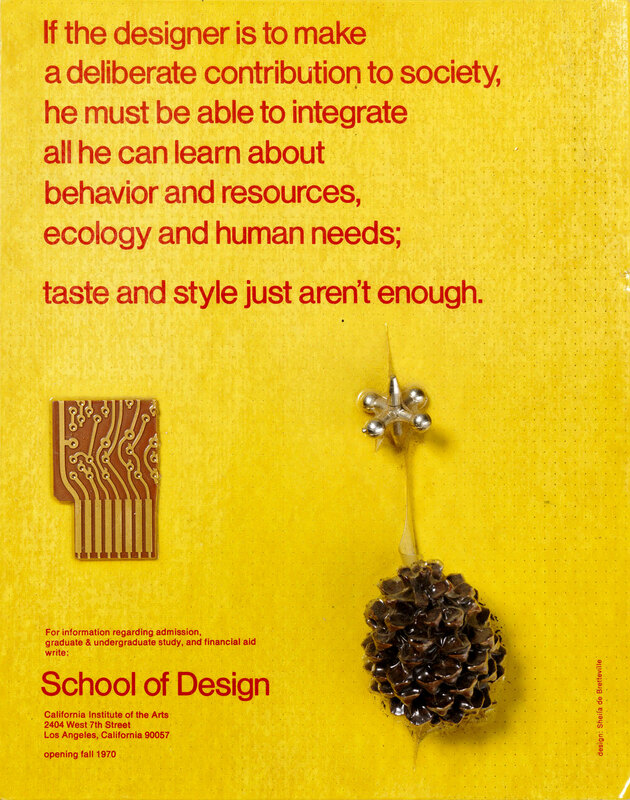 "Taste and Style Just Aren’t Enough (flyer for the School of Design, California Institute of the Arts)." Now Dig This! Art in Black Los Angeles, 1960–1980 Digital Archive. Los Angeles: Hammer Museum, 2016. https://hammer.ucla.edu/now-dig-this/art/taste-and-style-just-arent-enough-flyer-for-the-school-of-design-california-institute-of-the-arts.